BEST OPTION Summit Grill Center vs. Performer/WSM/26 combo. Hypothetically, If money was no object and you had a choice, what would would you take? Option 1: Performer deluxe, WSM 22" and a 26"
Option 2: Charcoal summit grilling center. Under either scenario I would still have my genesis and an extra 22" kettle for extra cooking space, tailgating, travel etc. I currently have option one but I'm curious if option 2 would serve me better. While the group in option 1 can feed an army, i never do cooks that big. The performer gets used 2-3 week. The WSM gets used 5-10 year and the 26 gets used 3-5 times year. I seldom if ever use two grills at once. With option 2 I would have the capacity of any of the grills above if I use I expansion rack and it would get me back a ton of patio space - which would make my wife happy. Would love to hear the feed back of the group. Again, money is no object in this hypothetical and I never do really big cooks where multiple grills would be used together. Either way I would have an extra 22" kettle for travel and overflow. Re: BEST OPTION Summit Grill Center vs. Performer/WSM/26 combo. Based on the information given I think the best solution is option 2. Less to store and great versatility with option 2. Option 3 Buy a bigger house and keep them all. I have all of those except a 26" (which i will get eventually!) and I use them all. Maybe not at the same time, but you'll find that certain grills do things a certain way and you like it. For instance, I have used my WSCG all week for dinners, but last night I wanted a rotisserie chicken, so I fired up my performer. Sounds like you haven't caught Weberitis yet, but you will and you'll find the room... DOOOOOOOOO IT. I've wondered about this same scenario too. I am squarely in option #1 right now. I have a performer, a 26", a 22" WSM, and another 22" kettle (I also have a SJS, a SJP & a nib blue otg that I'm keeping that way). 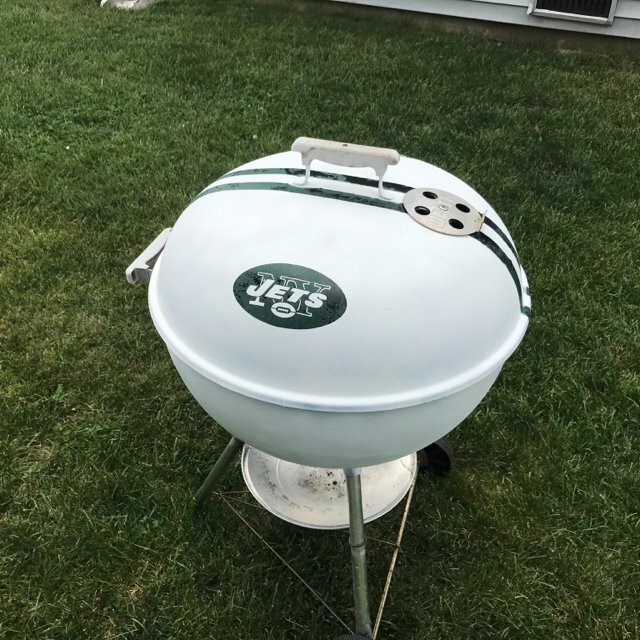 My buddy has a Primo ceramic oval that is the rough equivalent of the Summit Charcoal Grill. We go back and forth on which route is better. Naturally, we each like the way we've gone. I would like a Summit Charcoal, but I don't think I'd be willing to give up my current grills for one. I often feed an army and regularly use multiple grills at a time (sometimes just because I can). If space is an issue and money is not? Option 2, otherwise option 3 is a no brainer!! Ah man you def need a WSCG then...... Nice looking family. Well, the wheels are in motion to go all in for the summit. Sold my 26" tonight, same buyer wants to come back for my performer... I feel dirty. You wont feel dirty when you fire up your WSCG.... Good luck! Agreed - You won't regret the decision one bit. I sold two 26'rs, a 22.5" WSM, and a Performer and would do it again in a heartbeat. You get the grill space of the 26r, the convenience of the gas assist Performer, and it smokes just as well as a WSM... all while using noticeably less charcoal.